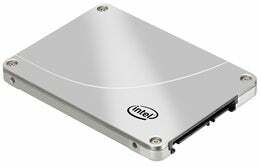 The newly announced Intel SSD 320 Series represent a significant upgrade to the company's existing lineup of solid-state drives. This series boosts capacity to a maximum of 600GB and improves performance, at a better price than the generation of SSDs it replaces, Intel's popular X25-M series. We ran the drive through our tests in the PCWorld Labs, and found that it did indeed hum in its performance -- putting it right up there among a tight and fast field. The 320 Series fulfills the promise of Intel's 25-nanometer (nm) multilevel cell (MLC) flash manufacturing process. This process, which ramped up production through 2010, increased SSD capacity points and reduced production costs by packing 8GB of storage on a single 167mm flash die -- which is twice the capacity the previous 34nm process could produce. With the 320 Series, Intel has gone beyond simply revving the flash inside. Everything about the SSD is redesigned. It uses an all-new Intel controller and supports 128-bit AES encryption (joining the parade of self-encrypted drives that are fast becoming standard fare). The 320 Series also enhances data reliability through extra data arrays that amplify the error correction already in the flash, and adds a failsafe to enable the drive to complete writing a file even if it's been interrupted by a loss in power. Given these new features, the drive should have no difficulty appealing to its target audience of consumers and business users alike. Intel even expects the 320 Series to find a home in data center and server applications, as a replacement for 15,000rpm hard drives. Against the field of 14 SSDs evaluated in the PCWorld Labs, the 300GB Intel SSD 320 Series drive we tested proved a solid, well-rounded performer. It bested all comers at our write files and folders test, and tied for top honors on our write a large 2GB file and Open Office uninstall tests. It beat its X25-M predecessor on four of our nine tests, and tied that drive on the rest. And it even edged the 160GB SSD 510 Series, which is a 6Gbps SATA drive aimed more at enterprises, on our write files and folders test, though just barely (the 310 Series lagged on two other tests, and tied the 510 Series on the remainder). The 320 Series showed its most notable result in its write speeds. Here, Intel claims significant boosts (well upwards of 100 percent for random and sequential writes) in its own synthetic benchmark testing. In our real-world tests of the drive, we saw an 11 percent improvement, whereby it took 34 seconds to write 2GB of files and folders, whereas the X25-M required 38 seconds to perform the same task. It also shaved seconds off our Open Office Installation test, two of our WorldBench 6 tests (using Photoshop and Nero 7). While much remains debated about SSD reliability, Intel makes a point of noting that since the company manufactures the flash, it can hand-pick top grade that's optimized for use in computing environments. By comparison, some SSD manufacturers may integrate flash die that were manufactured with other uses in mind. In a briefing, Intel also revealed its internal field data on the reliability of its X25-M SSD, as deployed across Intel's own workforce. The numbers show a total annual failure rate of about 0.4 percent, across more than 1 million drives. Intel declined to supply expected retail pricing, but the company expects the drives to sell in quantity for $89 (40GB), $159 (80GB), $209 (120GB), $289 (160GB), $529 (300GB), and $1069 (600GB). By comparison, the 256GB Crucial RealSSD 300 currently sells at retail for $475, and the 160GB Intel X25-M sells for about $410. Intel has said it expects the 160GB SSD 320 Series to sell for "about $100" less than the X25-M. Still, considering that a year ago a 256GB SSD cost around $750, if Intel's expected volume prices can translate into retail prices, Intel's new lineup could help speed SSD adoption.